Having access to 24/7 potable piped water in the comfort of our dwelling is a luxury that many of us take for granted. In the UK, an annual water and sewerage bill of £400 accounts for about 1% of the annual average household income of £40,000. This ‘safely managed’ water service, defined as having access to an improved source within one’s premises, is well within the widely established global affordability threshold of 3-5% of one’s household income. Estimating payments for water as a percentage of households monthly expenditures may adequately reflect ‘affordability’ in contexts where households have connections to piped water systems or rely on paid sources only. 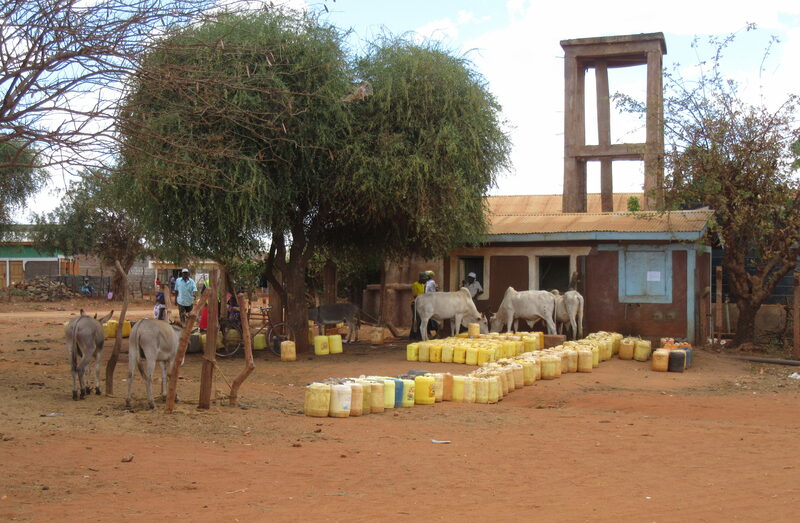 However, in areas with severe water stress or weak governance, people often resort to unimproved and unpaid sources to cope with unreliable or absent water supply services. 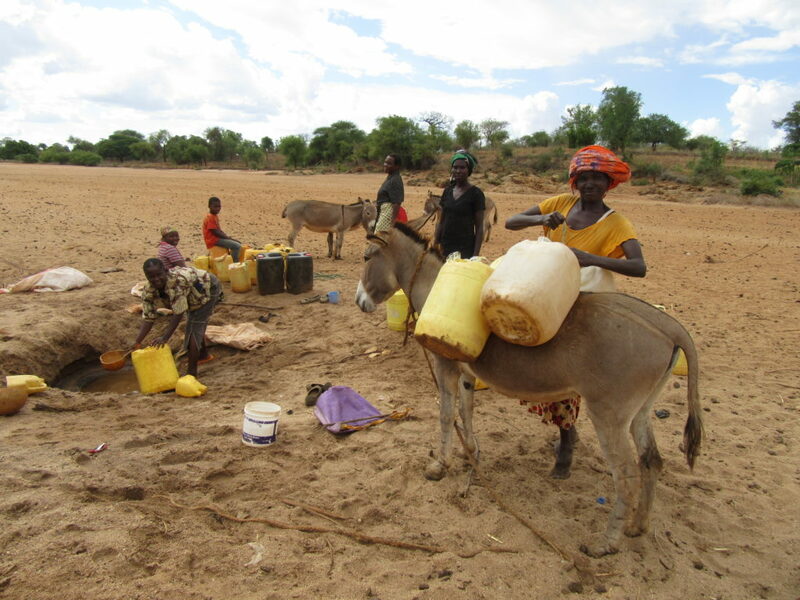 In Kitui, a semi-arid rural county in Kenya, for example, households often rely on the murky water scooped from dry riverbeds or earth dams when boreholes run dry or kiosks cease to operate due to damaged pipes. Should water be considered affordable when households incur zero expenditures for using free yet unsafe sources? What about the situation when households forgo other necessary expenses on food or education to purchase vended water at many times the cost of that sold at a public kiosk? Water cannot be deemed affordable if paying for water services prevent individuals from acquiring other basic human rights. Current approaches for measuring affordability, which largely depend on high quality but infrequent national surveys and censuses, are inadequate to capture the complex water use behaviours in such variable and unpredictable contexts. Water is intrinsically linked to people’s day to day lives; examining the experience of water (in)security requires intensive research methods that ‘capture life as it is lived’ and record events and processes as they unfold over time. 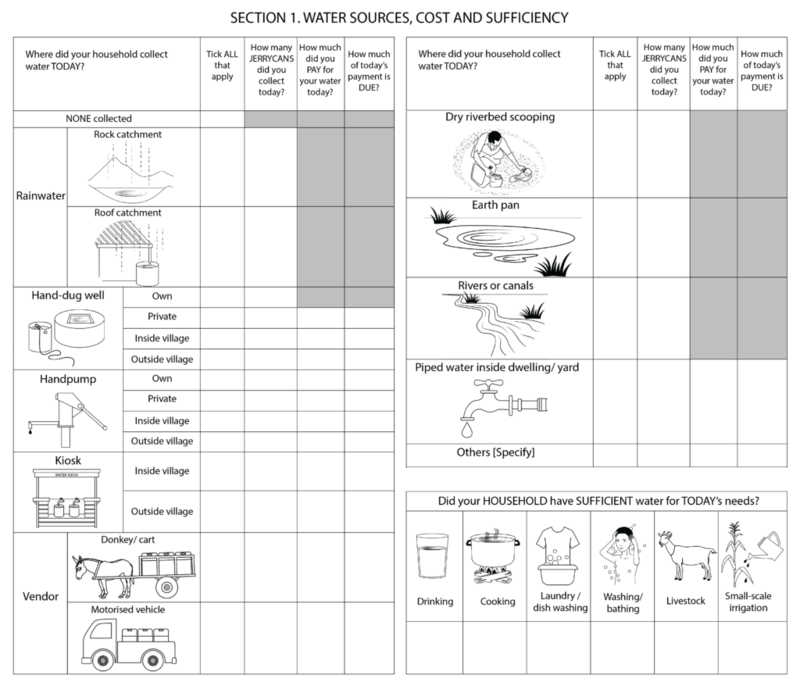 As such, we are implementing the ‘Water Diary’ method – an intensive longitudinal research tool designed to gather fine-grained empirical evidence on households’ water use behaviour in relation to the various hydro-climatic, socio-economic, infrastructure and institutional risks that influence their choices on a day-to-day basis. Water diaries document the sources, volumes and cost of water collected every day, along with self-reported changes in ‘sufficiency’ by consumptive (drinking and cooking), hygiene (laundry, dish washing, cleaning and bathing), and productive uses. It also collates weekly household expenditure data to explore variation in payment behaviours across food, farming, health, education, transport, energy, water and other domains. The method was piloted with a sample of 11 female respondents in rural Kenya over a 28-day period in April 2017 (Hoque and Hope, 2018). While the diary method can avoid recall bias associated with remembering seemingly mundane tasks at a later date, it requires intensive training and supervision to ensure that participants with low educational attainment can understand the task and are motivated to continue it for long periods. Following the success of the pilot study, we are now implementing the method in selected REACH observatories, namely, Wukro (Ethiopia), Lodwar and Kitui (Kenya), and Dhaka and Khulna (Bangladesh). Data from REACH households surveys (2017-18) are used to select a sub-sample of households (approximately 120 households in each observatory) across different wealth and water (in)security profiles. Selected households are invited to participate in small group training sessions, and thereafter, recruited for a one-year daily diary study provided they are willing to participate. We are particularly recruiting the women of the households, as they usually bear the burden of fetching water, and ensuring that our monthly non-monetary compensations adhere to their needs. The water diary offers a rich and largely unexplored landscape of continuous data that can inform and complement established efforts of monitoring affordability of safely managed drinking water services. There has been limited exploration of water affordability that distinguishes different contexts, such as urban versus rural, piped versus non-piped households, alternative water sources, rainfall variability, economic shocks or service quality. Measuring global progress, accelerating service delivery and attracting over a USD100 billion in new finance each year will partly depend on understanding and addressing this affordability puzzle.